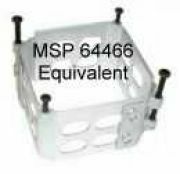 64466 equivalent mounting clamp. (3ATI, 2" DEEP CLAMP) This clamp is a ARINC 408 3ATI Square Clamp that is 2 inches deep. It is anodized per MIL-A-8625, Type 2, Class 1, Clear. This clamp has self locking closing brackets and stainless steel screws.